The purpose of setting in transition is to become good at transitioning from defense to offense. This is important to practice because mentally there is a lot going on, especially for the setter. To make executing a play easier, it's important to anticipate what you need to do. For the following scenario, imagine the setter is on the front row, positioned at the net, and running a 5-1 offense. ﻿Watch the opponent and anticipate the attack. Decide to jump to block or move off the net to defend. If blocking, be aware of where the ball is being attacked. Upon landing, turn and anticipate the pass and react. Make a move to position to set while being aware of teammates. Decide to 1) set a teammate, or 2) attack the second ball. As you can see, in just a matter of seconds, there is a lot going on. If a setter hasn't practiced setting in transition, then it's likely the setter will feel overwhelmed and struggle at making quick decisions. The following drill is important to practice, because if the setter can't keep up mentally, then a play that would seem to be routine, may actually be very difficult to execute. The focus of this drill is for the setter to practice setting in transition. The setter focuses reacting quickly to the situation, getting in position, and executing the set. What's also important here is for the setter to read the pass coming off arms. 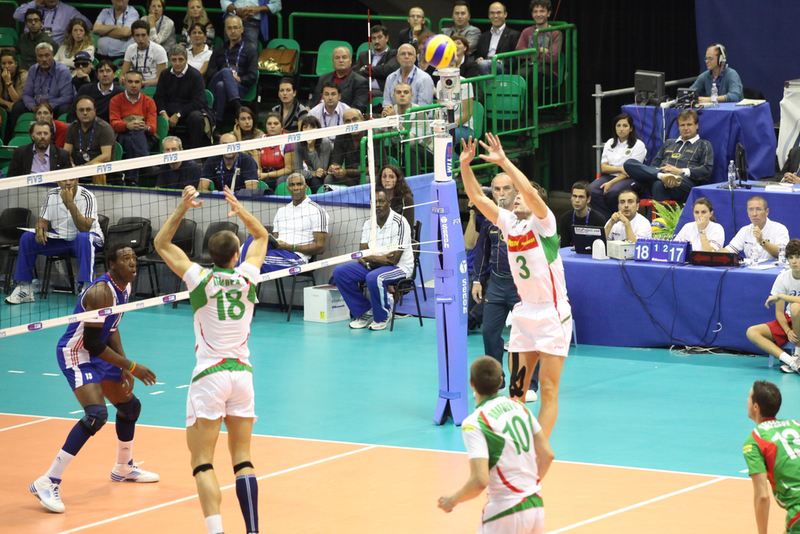 The better the setter is at reading the pass, the easier it will be to get in correct position to set. For this drill, the setter starts in blocking position at the net. With the setter positioned at the net, the coach starts the drill by tossing a ball to a passer. As the ball is being passed to the setter, the setter reads and reacts. The setter then makes a move and gets in position to set the ball to the outside target. This is a mentally tough drill for the setter. This is where anticipation is so important. The more the setter understands what to watch for and anticipate, the better the setter will be at making the correct decisions for the given situation. Force the setter to read the play by tossing the ball to different areas of the court. For example, when the ball is sent deep, the ball will more likely be passed further off the net. The setter needs to recognize this and make a move coming off the net quickly and get to the ball. Also, toss the ball short forcing a player to run quickly forward to make the play. For this situation, since the player is quickly moving forward, the setter needs to recognize the ball is more likely be passed lower or tighter to the net. It’s important for the setter to practice setting in transition because things are happening very quickly. There is a lot going on and the setter needs to make quick accurate decisions. It's usually best to always start training by making the drill easy as possible in the beginning. You want early success and not too much chaos. As the setter learns to process information faster, gradually work towards making the drill more difficult. For example, a way to make the drill easier would be to toss the ball higher to give the passer more time to pass the ball. This will give the setter more time to turn to face the passer and read the ball. As skills advance, send the ball in quickly to different areas of the court to challenge the passer which will also allow less time for the setter to read and react to the ball.